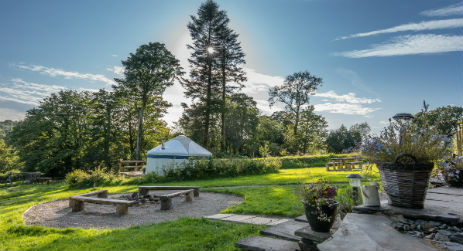 From Farm Yurt Retreat offers glamping on an organic farm nestled in a secluded valley near the majestic Preseli Mountain in Carmarthenshire West Wales. 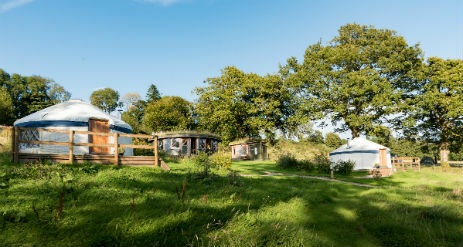 Glamp in a handmade Yurt or Roundhouse just 30 minutes from Pembrokeshire, Carmarthenshire and Cardigan Bay Coastlines, an excellent base from which to explore West Wales. The Farm has sheep, goats and chickens and a large organic vegetable garden, landscaped areas, ponds, woodlands and pastureland. By arrangement guests can visit the goats at feeding time, help collect the eggs from the chickens, and are also welcome to enjoy the pasture land and woodlands. 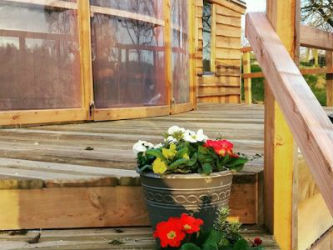 The extensive gardens are great for enjoying an evening stroll or a game of hide and seek. There is even a public footpath running through the farm which winds down to a country lane and eventually takes you to the local pub in Llanglydwen. Fron Farm Yurt Retreat is a family run, small and friendly glamping site giving visitors a haven to escape the hustle and bustle of everyday life. 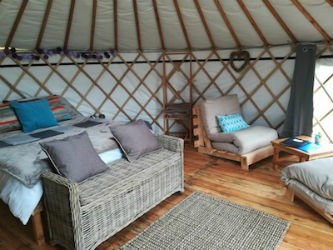 All our accommodations are handmade on the farm by Guy at Fron Farm Yurts, giving you a unique glamping experience. 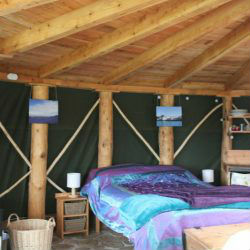 Both our yurts have been lovingly handcrafted to provide you with a beautiful space to enjoy during your stay. 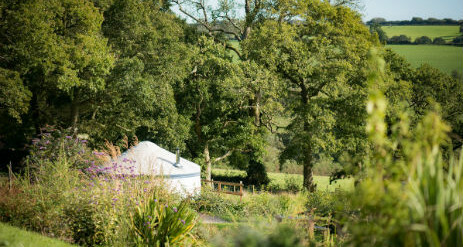 Buzzard Yurt and Kite Yurt are located in a landscaped flower meadow next to the pond and looking down the wooded valley. 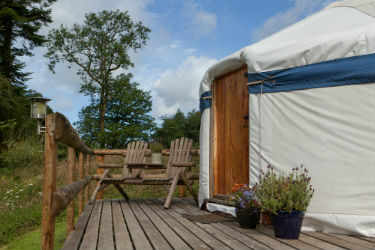 The yurts sit below a communal Rustic Roundhouse which is used by the yurt guests for cooking and dining. A short walk away is the toilet and shower block. 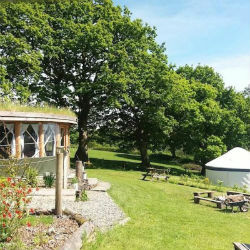 Cooking and dining facilities for the yurts are located in the amazing Rustic Roundhouse, Ty Crwn which is a large space equipped with gas hob and oven, two fridges, a freezer as well as being fully stocked with all the cooking equipment you should need. All you need to bring is your food. 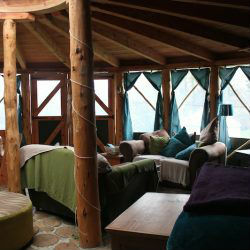 There are two large dining tables as well as two comfy sofas next to a large wood-burner. For entertainment there is table football, a box full of board games and books to share. 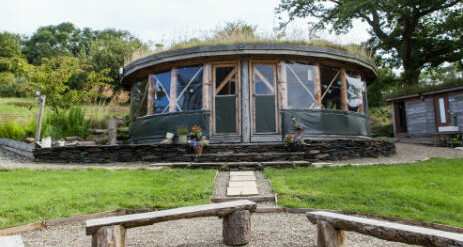 The Roundhouse makes a great space for group gatherings and family get togethers but is also large enough for two separate families to eat and cook. 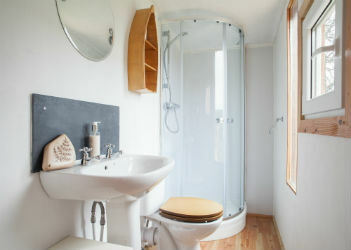 Adjacent to the Roundhouse is the toilet and shower block with two power showers which are fed by water from the spring on the farm and is heated by solar PV. 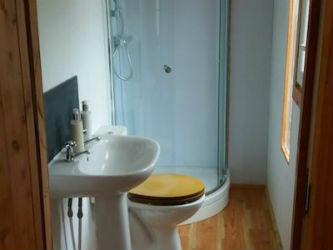 The shower block has one flushing toilet as well as a hand washing sink. A little further down the field is a separate Ty Bach (toilet) with flushing toilet and hand washing sink. 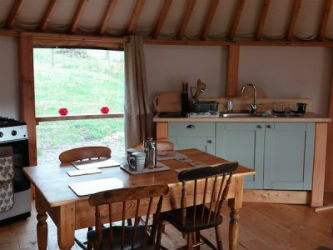 Our Rustic Roundhouse is available to rent all year round. 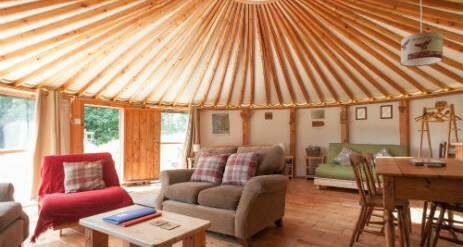 It is a stunning large space beautifully constructed here on the farm using local timber posts, a cordwood floor and a clear roofwheel window and turf roof. 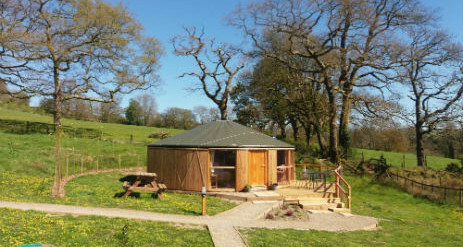 It has views that look down the valley and provides a large warm area in which to eat, drink, chat, play games and sit around the cosy wood-burner.